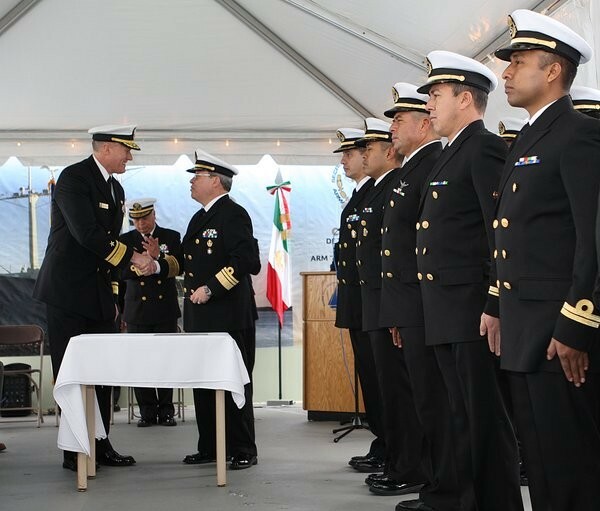 R/V Knorr is turned over to the Mexican Navy in ceremonies at Woods Hole, Massachusetts. The Bay City-built research vessel Knorr, that helped the Woods Hole Oceanic Institution (WHOI) find the Titanic in 1985, has changed flags. The R/V Knorr, built in 1970 by the Defoe Shipbuilding Co., Bay City, has been enlisted in the Mexican Navy and now is known as the Rio Tecolutla. R/V Knorr was named in honor of Ernest R. Knorr, a distinguished hydrographic engineer and cartographer who was appointed Chief Engineer Cartographer of the U.S. Navy Hydrographic office in 1860. Knorr was one of the leaders of the Navy's first systematic charting and surveying effort from 1860 to 1885. According to David Abel of the Boston Globe: "The R/V Knorr has sailed nearly 1.4 million miles from the Arctic Circle to the Southern Ocean, and crossed the equator 43 times. Its crews have taken more samples from different oceans than any other research vessel in the United States." The Navy turned the ship over free to the Mexican Navy March 14 after the Mexican government put up $3.3 million to outfit the historic vessel at a yard in Veracruz and train the new crew. The Woods Hole Oceanographic Institution had operated the ship since 1970, but the 279-foot vessel now will have a new home port in Manzanillo, on Mexico's west coast. Naval officials from both countries gathered for an official signing of the transfer certificate. The Mexican flag was raised over the ship and its new name was emblazoned on its aft. "From one mariner to another, you are getting a fine ship," said Rear Adm. Chris Sadler, reserve deputy director of maritime operations for the U.S. Navy. Dozens of Mexican navy personnel spent more than a month on board, learning every inch of the vessel from WHOI personnel both while the ship was docked and during a week-long shakedown cruise. Andrea F. Carter, of the Falmouth Enterprise, who was on hand for the transfer ceremonies wrote: "Representatives from WHOI, the US Navy and the Mexican Navy along with the ship's crew and about 30 invited guests, sat under a tent on the ship's deck to watch the ceremony, which began with the sound of a bosun's whistle and introductions of the official guests, first read in Spanish and then translated into English." Mark Abbott, WHOI president and director, noted the vessel arrived at WHOI in 1970 and over the years traveled 1.3 million miles on 250 missions, becoming a significant contributor to the scientific research culture at WHOI and nationwide. "Our time with the Knorr is now done; congratulations and smooth sailing to the people of Mexico," Dr. Abbott said.